One of the joys of being a Te Papa Host is when that ‘light bulb’ moment happens – when a visitor sees or experiences something profoundly new as a result of being in an exhibition. We’ve had many of these moments in Kahu Ora in the last 2 months, often centred around the weavers’ studio, Ngā Pā Harakeke o Hine-te-iwaiwa. In this hub of activity, visitors have the opportunity not only to see and talk to weavers as they do their work, but also to pick up and feel some of the materials and tools involved in the making of these beautiful kākahu. The sense of touch seems to bring everything together – once a visitor has immersed themselves in the displays and the stories around the gallery, they are often itching to get their hands on something! Somehow when they get to feel (and smell!) freshly-stripped muka (flax fibre) in the studio, they ‘get’ the hours of work, dexterity and creativity required to transform this magic material into something to keep you warm, safe, or recognised. Maryjane Winiata (right foreground) showing how the haro technique is done. Image copyright Te Papa. 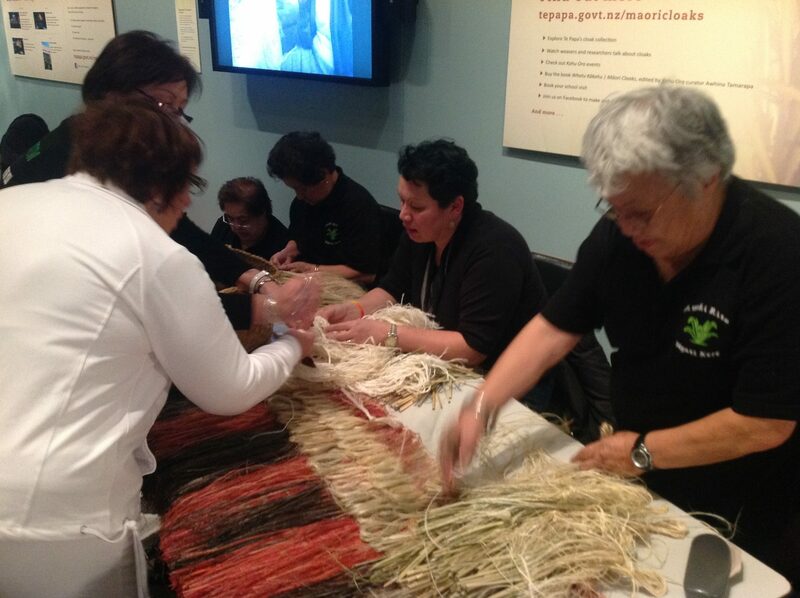 Many of our weavers have used hands-on samples to illustrate their mahi in their kōrero with visitors. One of our most commonly heard visitor comments is ‘I had no idea!’ as people handle a hank of whenu strands, or pick up the satisfyingly heavy patu muka, used for beating and softening the harakeke fibre. 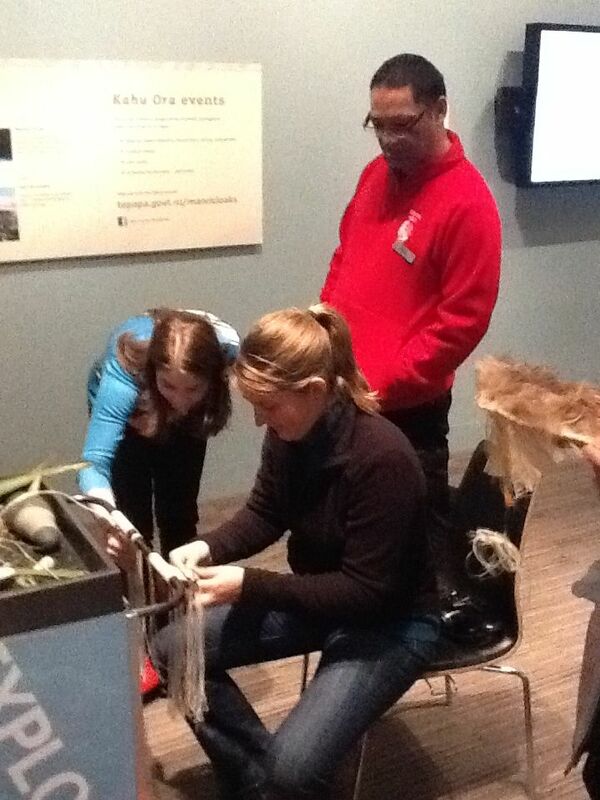 Weavers from Porangahau interacting with visitors. Image copyright Te Papa. 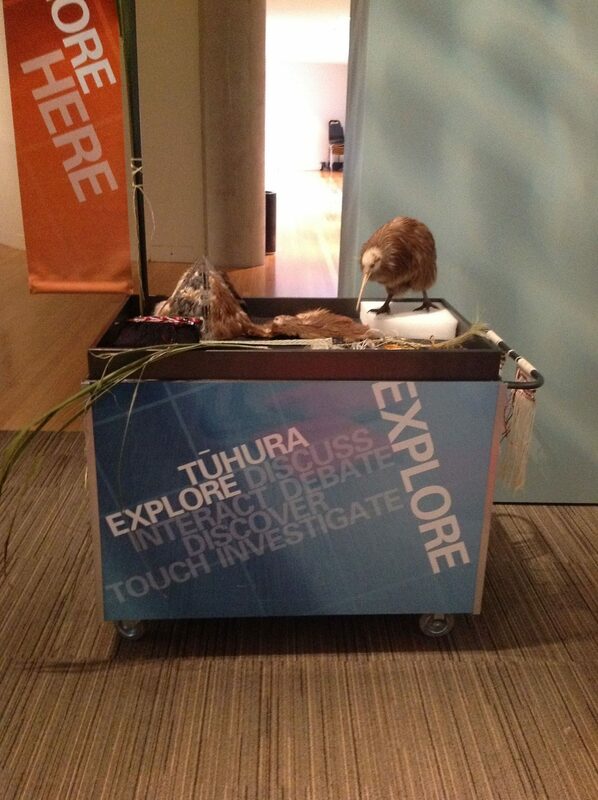 We also have the touch trolley loaded with examples of muka, weaving samples, feathers, and birds – very popular with the kids (though we often have to explain how come we have a ‘real’ kiwi sitting waiting to be patted!). And our international visitors in particular seem to love giving weaving a go, using our samples set up for learning the whatu technique. 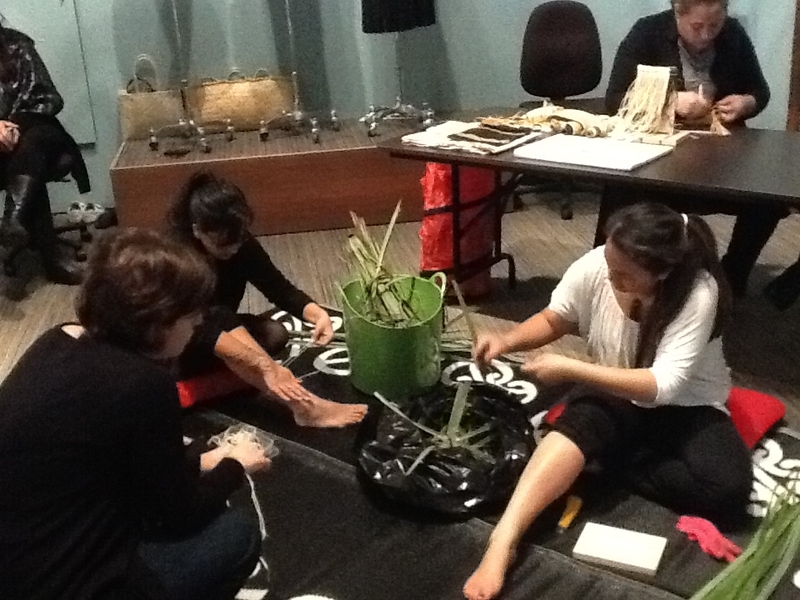 Hands on weaving for the first time. Visitor from France with hosts Hohepa Potini and Catriona McPherson. Image copyright Te Papa. Perhaps the most moving example for me of the power of tactile experience came when a group of young women bounded into the gallery one day at the end of a school trip to Te Papa. Three of them found their way to the touch trolley and were picking up all the items with enthusiasm. When I showed them how to strip a blade of harakeke, and gave them the length of silky smooth muka to feel, they fell silent; the eyes of one student in particular opened wide, and she asked how she could learn the craft. She took away not only the rolled strand of muka, but also the details of Kohai Grace’s weaving class at Whitireia Polytechnic. As the group left the studio, I called after her, ‘Good luck on your journey,’ and she stopped, turned around and said that that was her name – Journey! We’re looking forward to a further 6 weeks of magic in Kahu Ora, with lots more touching moments. Touch trolley in Ngā Pā Harakeke o Hine-te-iwaiwa. Image copyright Te Papa. I read the story to how i seen it through the peoples eyes! !